A new recruitment campaign launched in 2017 encouraged more women to apply to join Tasmania Police. The campaign – themed “You got this” – encouraged women to project themselves into the role of a police officer. Acting Sergeant Rebecca Sulman led the project. “The campaign imagery shows confident and competent police women and is designed to encourage women to ask themselves whether they have the attributes that policing requires,” she said. “As well as Facebook graphics and other online content, a series of short video clips provide a glimpse into the real world of four police officers, exploring their motivations and thoughts on their work,” she said. “I applied when I was 18 and the whole process was the most daunting thing I’d ever done. Sergeant Louise O’Connor describes her policing colleagues as a family. Senior Constables Rob Bessell and Anna Lang also feature in videos. A final video shows the fitness testing involved in gaining acceptance as a recruit, something the recruitment team says is one of the most asked about components of the application process. In the first two weeks of the campaign, applications from women increased by 700%. Of 161 applications received in the period, 109 were from women. 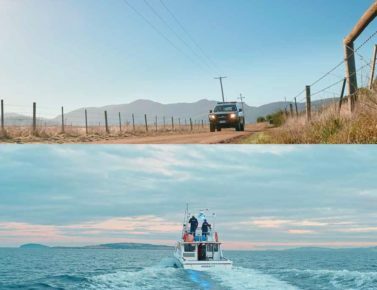 Top: Scenes from the 2017 Recruitment campaign, featuring Senior Constable Anna Lang, Constable Carly Lovell, Sergeant Louise O’Connor, Senior Constable Rob Bessell, Senior Constable Bec Sulman. 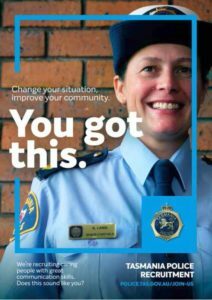 Above: The “You got this” poster, featuring Senior Constable Anna Lang. This page -- https://www.police.tas.gov.au/about-us/100-years-women-policing-tasmania-police/recruitment-and-training/2017-recruitment-campaign-sees-applications-women-soar/ -- was last published on January 23, 2018 by the Department of Police, Fire and Emergency Management.